Jim Lo Scalzo-Pool/Getty ImagesDonald Trump. 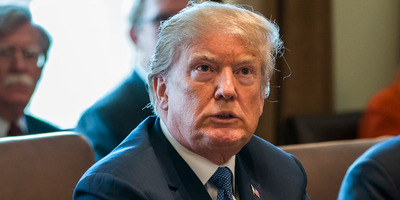 The Trump Organisation appealed to Panama’s president for help in a business dispute, The Associated Press reported, citing a March letter from the law firm representing the organisation. The organisation asked the Panamanian president to intervene in a legal dispute over a luxury hotel – and warned of consequences to Panama if he didn’t. The move is another example of the increasingly blurred lines surrounding Trump’s business and his presidency. Lawyers representing President Donald Trump’s namesake business appealed directly to Panama’s president for help in a dispute over a luxury Panama City hotel, The Associated Press reported Monday. The AP said it obtained a letter dated March 22 in which the law firm Britton & Iglesias asked Panamanian President Juan Carlos Varela to intervene in the legal dispute, arguing that the courts denied the Trump Organisation due process and violated a bilateral treaty. The letter also warned that there could be consequences for Panama if he didn’t, the AP reported. The letter brings to the forefront issues involving Trump’s businesses and potential conflicts of interest. The dispute gained notoriety in February when Orestes Fintiklis, the majority owner of the Trump International Hotel and Tower in Panama City, arrived with associates in the lobby with the aim of ousting the Trump Organisation, which has managed the hotel since its 2011 opening. The organisation, however, refused to leave. Over the next few days, police were called to the property to “keep the peace,”the AP reported. And after Fintiklis and his associates delivered termination notices to Trump Organisation employees at the hotel, witnesses said they saw Trump executives moving files to a room to be shredded. Fintiklis wanted to drop the Trump name from the building and argued in court documents that the Trump Organisation’s mismanagement caused occupancy levels to drop while expenses rose. Fintiklis claimed victory last month, saying Panamanian authorities allowed him to take over the hotel’s administration. “Today, this dispute has been settled by the judges and the authorities of this country,” Fintiklis said, adding that he was so impressed by Panama’s legal system that he would seek citizenship in the country. The hotel has since been renamed the Bahia Grand. On March 27, a US arbitrator ruled that the Trump Organisation shouldn’t have been evicted while arbitration was ongoing, though he did not reinstate the hotel’s management. Instead of divesting himself of his businesses or placing them into a blind trust before taking office, Trump passed control to his two sons and a senior Trump Organisation executive – a move ethics experts said did not go far enough in addressing potential conflicts of interest. Experts told Business Insider last month that Panama provided an example of such a conflict. Any US decision affecting Panama will be under the microscope, said Larry Noble, the senior director and general counsel of the Campaign Legal Center. “It could be a trade deal, it could be aid of some sort, it could be a rule involving the Panama Canal,” Noble said.